Suitable for return air in side-walls and ceilings without need of an opposed blade damper, since return air is not normally room balanced. 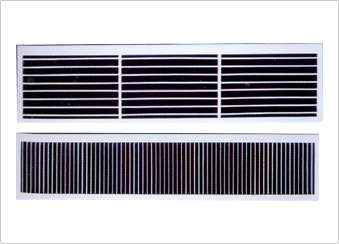 Available with either vertical or horizontal louvers or both, in aerofoil shape to reduce frictional losses. Model AB-SG-SV-RA horizontal louvers in the front and vertical in the back. Model AB-SG-SH-RA vertical louvers at the front and vertical in the back. Model AB-SG-SV-SA same as DHV but with VCD. Model AB-SG-SH-SA same as DVH but with VCD.